As you likely know already, the "Mayor of Hell," as dubbed by Rolling Stone, has become the Lieutenant Governor of the Keystone State. In the May 2017 primary election, John Fetterman ousted sitting Lt. Gov. Mike Stack and joined Democratic incumbent Gov. Tom Wolf on the ticket for his second bid to govern Pennsylvania. In a decisive victory (one most major outlets called before any official polls results had posted) against a Republican ticket featuring gubernatorial candidate Scott Wagner and Jeff Bartos on the undercard — a state senator and real estate developer-and-political outsider, respectively — Wolf defended his turf and cemented his second term in Harrisburg while Fetterman secured his first. There were, unsurprisingly, no golf spikes to the face. You likely also know that the 6-foot-8-inch tall former mayor of Braddock, Pennsylvania isn't one to wear suits. Also, that story is getting old. But still, he laughs about it. While he's occasionally seen in the state capital donning a suit, he's still more often likely be to sighted in his signature black, short-sleeve Dickies button-up and jeans. Rest assured, Pennsylvanians, the office hasn't changed the man; the man is who he is. 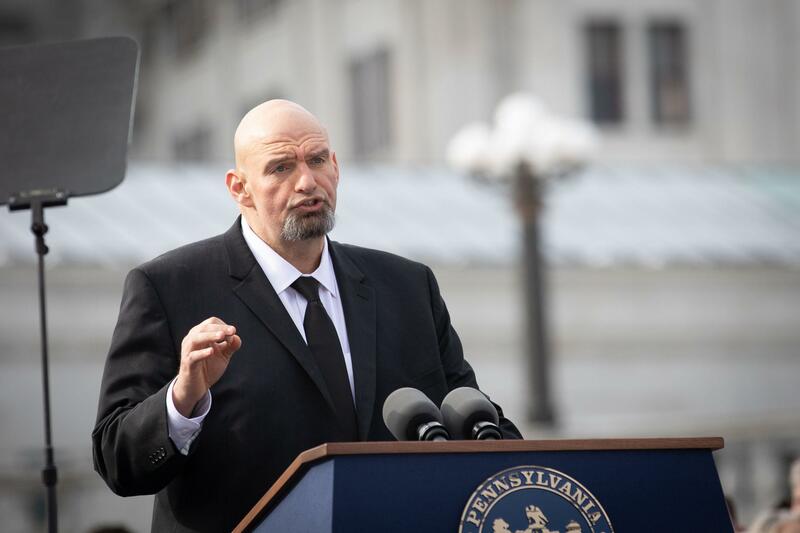 Most recently, though, folks are catching Fetterman in his iconic garb on the trail — not the campaign one, but a statewide sojourn to each county to discuss recreational marijuana and whether there ought to be a push to legalize it. Wolf signed a bill to provide access to medical marijuana in Nov. 2016 (some cities have moved to decriminalize marijuana use, including Erie). The consumption of marijuana in the recreational sense, however, remains illegal in the state. But Fetterman is out on the road, ready to listen. To date, 10 states (Alaska, California, Colorado, Maine, Massachusetts, Michigan, Nevada, Oregon, Vermont, and Washington) and Washington, D.C. have fully decriminalized and legalized marijuana. Pennsylvanians now have the chance to voice their opinions in their home counties. On Saturday, Feb. 16, Fetterman made his stop in Erie, welcoming a crowd of 250-plus at the Jefferson Educational Society. The third stop on the circuit, Erie packed the auditorium for what would be a civil conversation. And one that resulted in a chorus of approval. 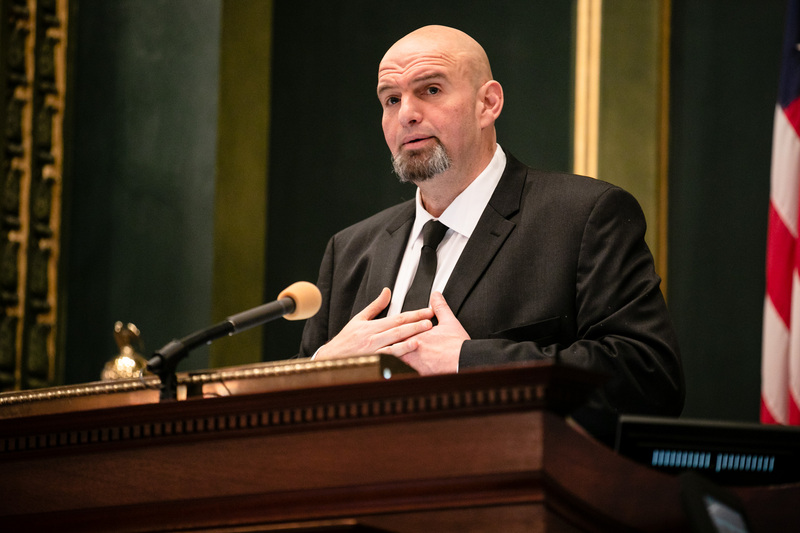 Before Fetterman took to the stage to hear Erieites' cases for and against (about 50 people spoke and the majority supported it), I had the chance to chat with the Lt. Gov., who's been no stranger to the Flagship City and who makes it clear he loves Erie (before the recorder went on, he recounted various prior visits and expressed his appreciation of Lavery Brewing Company's craft beer and his wife's of Romolo Chocolates). Here's Fetterman in his own words on transitioning from mayor to lieutenant governor, recreational marijuana, and still being asked about wearing suits and ties. Ben Speggen: I'd like to talk to you about the transition from mayor (of Braddock, Pennsylvania) to Pennsylvania Lieutenant Governor. What's been the biggest challenge for you in this new position? Lt. Gov. John Fetterman: Well, there really haven't been any challenges, per se, I think. My former role scaled up. And it's just trying to be as responsive as you can, help when you can, hear and listen always, and be accessible. Today, what brings me to Erie is an extension of that. I think it's important that we have a conversation and to be accessible. I know the governor — that I'm honored to serve — is always about 67-county solutions. And that means going to all 67 counties — it's not lip service; it's not a slogan. It's a way of governing. As we were talking before, I'm just a huge fan of Erie, and there are challenges Erie's had that are similar to [those in Braddock], but Erie also has a lot of assets that our community doesn't, and I genuinely love getting out and coming to places like Erie. BS: And so if everything goes exactly as you want it during your 67-county tour, what would you perceive that outcome to be? If "we" did our job the way we wanted to do it. JF: That's the beauty of it. My only goals are to: 1. Get to every county, which we absolutely will. 2. For it to be civil and open and to be participatory. And that's it. Whatever's said is beside the point as long as it conforms to those guidelines. I say the folks of Harrisburg and Mechanicsburg have set a really high bar — no pun intended — [laughs] you know, somebody called me out on that and said "you know he said 'high'" [laughs]. There's the Beavis laugh — "haha, you know, he said 'high'" so I have to say that now — but it was very democratic. And, pro or con, there was no heckling, there was no "boooo." We're here to — and I don't mind applause, where if you say "I'm against it" and someone [claps] that's fine — there's no heckling. I want there to be a safe place for everyone to share their views regardless of what they are. BS: Recreational marijuana — why is this important to you? JF: Me, personally, I say my views aren't interesting. What's interesting to me is what everyone in the auditorium will say. It's important to me, as a candidate and now an elected official, for a bunch of reasons: First, I think it needs to come out of the shadows and it needs to be addressed for racial disparities of enforcement and how the criminality aspect of it has disproportionately affected people in communities of color, and I think that's the prime motivation for me. Second, it will generate several hundred million dollars worth of revenue… That revenue can be used for issues, projects, policies, programs — that if it ever gets to that point, that the legislature could decide on. Also, it brings it out of the shadows and creates a product that is regulated, taxed, that can't be spiked, that can't be manipulated, and isn't subjected to crime. BS: Walk us back to the first conversation you had with the governor about this plan: "We're going to talk about recreational marijuana, and we're going to do a 67-county wide tour." Why for this administration? Why does this matter? Why you? JF: I can't, and I wouldn't, speak for Gov. Wolf, but what I do know is Gov. Wolf is open to conversation and ideas — that's one of his many, many fine qualities. He believes, as I do, that it's important to have that conversation, and to have that conversation standing in the communities of every county across Pennsylvania. There wasn't convincing or back and forth — it was things we just agree on both from a personal standpoint and he is 100 percent supportive of this. There is no guided discovery, there is no me championing it. There is "you have the floor, you say what you say," and that's how it goes. BS: What has the reaction been so far? JF: People are very happy. I pride myself in having this be truly open and democratic, because that's what is has to be [claps] "say what you have to say and next and next, next." And we close out every meeting with a show of hands: All of those "aye," all those "no." Everybody in Pennsylvania can go to the website and see what it looks like in each room in each county in Pennsylvania so that it's fully transparent. BS: Once you hit county No. 67, what's the next step for this? JF: The next step would be a deliverable for the governor and it'll be shared with the people of Pennsylvania… beyond that, I can't speak to that. BS: Final question: Are you glad people have finally let go of the "he's not going to wear a suit and tie" conversation. JF: [Laughs] You know, I have fun with it. I don't take myself seriously enough to let that bother me. It's no secret: I don't like wearing a suit [laughs]. I think that puts me in the majority of people, I don't know? Maybe I'm wrong? But, you know, to the "I love wearing suits club," maybe that's offense, but I think most people would agree with me, but it's who I am. Like me or not, it's who I am.